Comfort food is on the menu with the Hairy Bikers’ new cookbook, British Classics. Jenny Stallard meets them. Inspired by the likes of Keith Floyd and Rick Stein, the Hairy Bikers – aka Dave Myers and Si King – are now arguably the kings of cooking on the road. Well, that and kings of the cookbook: They now have more than 20 tomes under their belts, and The Hairy Bikers’ British Classics is their latest. In fact, it’s hard to think of anything they’re not kings of. Perhaps the biggest of all though is working friendship – when I meet them for the launch of British Classics, the pair could easily be mistaken for brothers. They’ve been working side by side for two decades, and are so comfortable together it’s clear these men are best mates – a friendship forged over ovens and hot plates and thousands of miles on their trusty bikes (which are called Doris and Gina Lollobrigida, in case you’re wondering). Luckily, King, 52, reveals that coming up with new recipe ideas has “never been a desert” for the duo. In fact, whittling down recipes to the shortlist for the book was harder work, because they are always thinking of ways to improve or tweak traditional dishes. The book is a great mix of hearty, meaty favourites and comforting veggie offerings. It’ll be accompanied by a nationwide tour in 2019, too – which will also be a good chance for the pair, who now split their time between Sittingbourne and the Loire Valley (Myers) and St Albans and Australia (King), to spend some proper time together. They’re keen for people to realise that fast food doesn’t have to mean you don’t cook it yourself. Myers, for example, grows basil in his garden in France and now has plenty of homemade pesto in the cupboard ready to make “Italian fast food”, pasta pesto. “I’ve used really good oil. 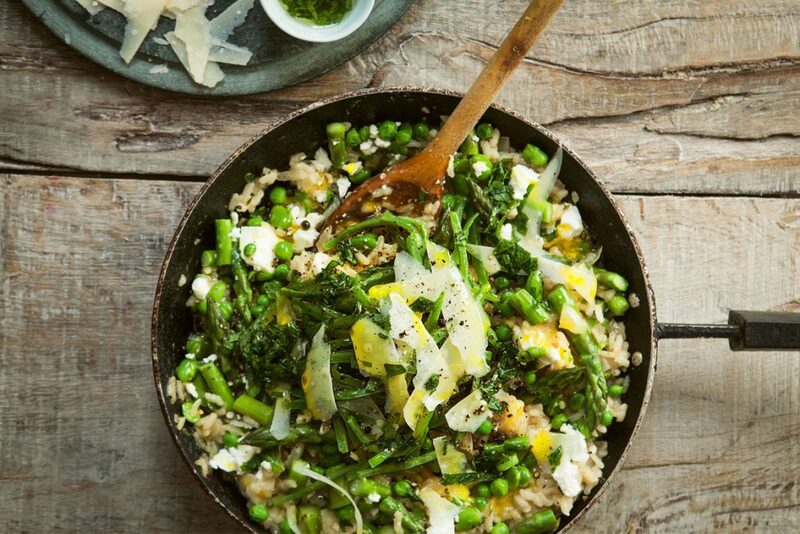 And I know now, if I just cook some pasta, with some purple sprouting broccoli to bulk it out, then put my pesto on… got a dinner in three minutes,” says the 61-year-old. As well as career high points, that’s included their share of health scares (Myers needed surgery to remove a cyst from his brain in the late-Nineties, while King suffered a potentially life-threatening brain aneurysm in 2014, and both men famously shed seven stone between them after being warned that their weight was a bit of a ticking time bomb). They’ve travelled a lot together too. Once, they were away with Myers’ wife on Valentine’s Day. “It was awkward when it came to paying. It felt only right that I should pay because it was her Valentine’s night!” he recalls with a laugh. And the bikes are by no means forgotten, as King assures with a grin: “It’s absolutely part of our DNA. Do you want to see my chopper?” He shows me his new bike, and explains that the exhaust is so loud he can, well, break wind and nobody hears. It’s a brilliant example of how down-to-earth these guys are. They’re British Classics themselves, really – an observation that makes Myers laugh (“That’s flattering!”). The Hairy Bikers’ British Classics by Si King and Dave Myers is published by Seven Dials in hardback, priced £22. Available now. First make the batter. Put the flour into a bowl and whisk it lightly to get rid of any lumps, then add a generous pinch of salt and the dried sage. Make a well in the middle and add the eggs. Work the eggs into the flour, then gradually add the milk. Alternatively, put everything in a food processor and blitz until smooth. Leave the batter to stand for an hour. Preheat the oven to 200°C/Fan 180°C/Gas 6. Divide the lard or goose or duck fat between two four-hole Yorkshire pudding tins or one 12-hole tin. Put the tins in the oven to heat up. Bring a small pan of water to the boil. Add a pinch of salt and the onion slices. Simmer them for three minutes, then drain thoroughly. Cut the sausages into rounds. Divide the onion and sausages between the tins. Put the tins back in the oven and cook for 20 minutes, until the sausages have started to look nice and brown. Remove the tins from the oven. 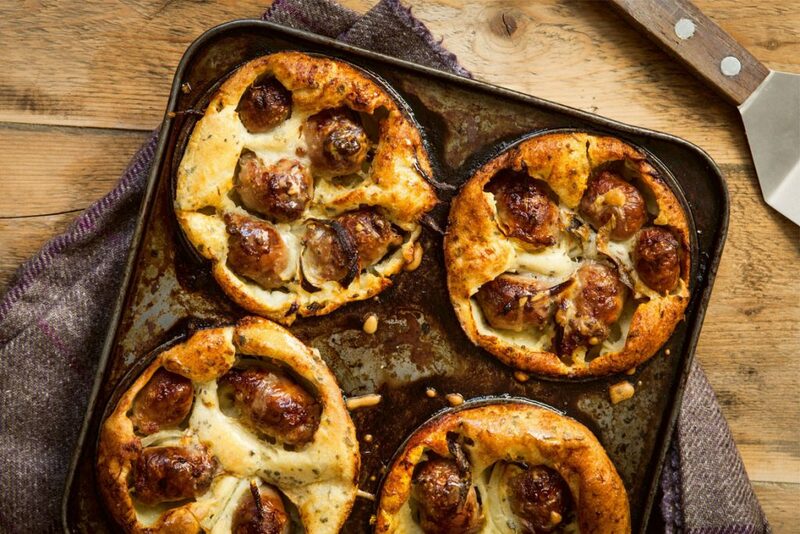 Pour in the batter around the sausages and onion – there should be just enough batter to reach the top of each hole. Bake for a further 20 minutes until the Yorkshire puddings have risen and are a dark golden-brown. Serve hot straight from the oven – with some gravy if you like. To make the minted oil, mix the mint and olive oil, then set it aside. Bring a pan of water to the boil, add the broad beans and bring back to the boil, then cook for one minute. Drain the beans and run them under cold water to cool, then remove their greyish skins and set aside. Melt 25g of the butter with the tablespoon of oil in a large pan and fry the onion for a few minutes until softened, but not coloured. Add the garlic and cook for another couple of minutes, then stir in the thyme, lemon zest, bay leaf and rice and cook for a few seconds longer until the rice is glistening. Pour the wine into the pan and cook over a medium heat until the liquid has reduced by half. Slowly start adding the stock, a ladleful at a time, stirring well in between each addition. Simmer for two to three minutes or until the liquid has almost all been absorbed before adding more. Continue to cook and add stock for 15 minutes or until the rice is tender. Meanwhile, bring a separate pan of water to the boil. Add the runner beans and cook them for three minutes, or until tender. Drain, then tip the beans back into the pan and toss with a small knob of butter and plenty of pepper. Remove the thyme and lemon zest from the rice and discard. Stir in the broad beans, peas and asparagus with the remaining stock and cook for 3 minutes until tender, stirring regularly. Remove from the heat and stir in the feta. Season with salt and pepper, then cover with a lid and set aside for a few moments. Add the remaining butter to the risotto and stir. Serve, topped with some runner beans, minted olive oil and shavings of Parmesan, if using.